Transform your bedroom with the vintage-inspired, relaxed and rugged styling of this bed. The bed is finished in an on-trend charcoal gray coloration. 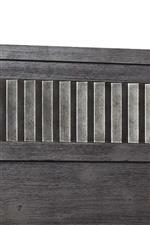 Detailing on the headboard mimics the look of corrugated iron to add an industrial feel. The Burbank King Bed by Klaussner International at Furniture Barn in the Pennsville, Bear, Newark, Hockessin, Middletown, New Castle, Townsend, Talleyville, Wilmington, Marshallton, Smyrna, Elkton, area. Product availability may vary. Contact us for the most current availability on this product. 992-066HB KHBD King Headboard 1 81" 3" 64"
992-066SR KRLS King Rails 1 82" 2" 7"
992-066FB KFBD King Footboard 1 81" 2" 23"
A favorite of today's interior designers, industrial style incorporates vintage elements for unique, welcoming interiors. This bedroom group is an easy way to give your master bedroom an industrial look. Functional storage space includes metal drawer guides for easy usability and USB charging ports in select pieces. For comfortable styling with a fresh, urban edge, choose this handsome bedroom set. The Burbank collection is a great option if you are looking for Industrial Transitional furniture in the Pennsville, Bear, Newark, Hockessin, Middletown, New Castle, Townsend, Talleyville, Wilmington, Marshallton, Smyrna, Elkton, area. Browse other items in the Burbank collection from Furniture Barn in the Pennsville, Bear, Newark, Hockessin, Middletown, New Castle, Townsend, Talleyville, Wilmington, Marshallton, Smyrna, Elkton, area.